Vitaliy Gnezditskiy, the General Director of PJSC “EMSS”, and Lilia Krempoha, the Trade Committee Acting Chairman of the enterprise, spoke at the conference with reports on fulfillment of the obligations under the collective labour agreement of 2016. 75 delegates were elected from the labour collectives to the conference. The conference was attended by the chairman of the regional trade union organization of workers of machine building and metalworking of Ukraine Alexey Pichahchi. The General Director noted that the planned social programs and activities of the collective labour agreement for 2016 totally are fulfilled, in his report. The plant regularly pays salaries, solved some of social problems of the collective, allocates money for the maintenance of the veterans organization of PJSC “EMSS”. It was also noted that the workers and their families successfully recovered at the recreation facility “Lipa” and “Aquatoria” as well. The average salary at Energomashspetsstal today is 8508.3 UAH. “The main positive result of the past year was that, despite the volatile economic environment and fragile political situation in the country, we managed to finish the year with relatively good financial and economic indicators. At the moment we are at the stage of signing very important for our enterprise nuclear contracts. Today the main task for personnel is to set ourselves up for performance to plan, for strenuous work hard to fulfill orders strictly”, -Vitaliy Gnezditskiy emphasized. 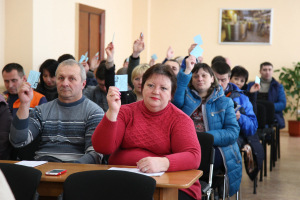 Summing up the results of the past year, the Trade Union Committee Acting Chairman of the labour safety of PJSC “EMSS” Lilia Krempoha emphasized that in 2016 8 050 251 UAH were spent on providing social exemptions, services and guarantees to the employees of the enterprise. This includes expenses for mass cultural events, sports and recreational work, special food and milk, coal (firewood) for veterans, payment of additional social vacations, material assistance for hard and long-term sick people, aid with expensive medicines and much more. The personnel accepted the work of the administration and the trade committee by fulfillment the collective agreement obligations as satisfactory. The conference approved new draft collective labour agreement for 2017 – 2018, in which, like in the previous one, all the social and labour exemptions of the enterprise employees were preserved. In the estimation of the branch regional trade union organization chairman “Mashmetall” Alexey Pichahchi, the collective labour agreement conference was successful; the new collective labour agreement was accepted without any disagreement. Alexey Pichahchi noted that the collective agreement of PJSC “EMSS” is the best among industrial enterprises in Donetsk region and Ukraine as a whole. 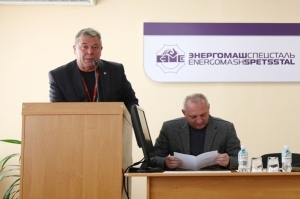 Alexey Pichahchi noted that the collective labour agreement of PJSC “EMSS” is one of the best among industrial enterprises both in the Donetsk region and in Ukraine totally. “PJSC” EMSS ” is estimable in comparison with other machine-building enterprises of the region. I am sure that the personnel will succeed in overcoming those ambitious plans announced by the General Director, the main thing is to choose the right course and meet targets, “said Alexey Pichahchi.